Paul Dzido remembers the weeks after the horsemeat scandal was revealed last year - because business boomed. 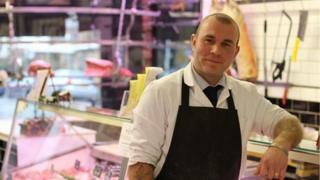 He runs the Hook and Cleaver butcher in Ealing, west London. "At the time trade really did go through the roof, especially with mince products, burgers, sausages, things like that," he says. Consumers had lost confidence in some supermarket products and favoured local butchers like Mr Dzido who could tell them more about the meat they were buying. The scandal emerged in mid-January, when Irish food inspectors announced they had found traces of horsemeat in some frozen beefburgers stocked by UK supermarkets including Tesco, Iceland and Lidl. Over the next few months a number of stores and suppliers across the UK and Europe had to remove products labelled as beef after test results revealed they contained varying quantities of horsemeat - in some cases up to 100%. As a result sales of frozen burgers and frozen ready meals plunged. The most dramatic decline came in March and April of last year when frozen burger sales tumbled 41% compared with the same months in 2012, according to figures from industry analysts Kantar Worldpanel. Frozen ready meals also saw a sharp drop in sales, falling 11% in March and 15% in April. But since that panic the frozen burger has made a comeback. For the 12 weeks to 8 December 2013, burger sales were down just 1% compared with the same period in 2012. The reason? Heavy discounting. Food retailers, including Iceland, discounted burgers after the crisis and shoppers found that hard to resist, particularly at a time when many households were struggling with tighter budgets. "If something is out there at half price you get huge spikes in sales, people immediately react to that," says Ed Garner, communications director at Kantar Worldpanel. However, frozen ready meals have not seen the same kind of recovery. The most recent figures show sales still down 6% compared with a year ago. Analysts say that is probably because shoppers were uncertain about the quality of frozen ready meals, even before the horsemeat scandal broke. "People were already predisposed to suspect frozen foods were somehow inferior," says Mr Garner. "It kind of confirmed matters when people saw that a frozen ready meal turned out to be all horse and no meat." As well as affecting sales, the horsemeat scandal has changed the way some customers shop for food. An Ipsos Mori poll run in partnership with the Grocer magazine shows that almost a third of respondents said the incident had "permanently impacted" the way they chose and bought food. And a survey carried out on behalf consumer organisation Which? in late November found that 49% of respondents said the horsemeat incident had changed their shopping habits, with 25% saying they bought less processed meat and 17% saying they bought more products from butchers and farmers' markets. And it seems that value for money is still the main concern for many shoppers. "Twenty-six per cent of the British public are buying cheaper food than they were a year ago, which may suggest that price is still a central factor in food choices," says Stephen Yap, head of Ipsos MarketQuest. According to the Ipsos Mori poll, Tesco and Iceland suffered more damage to their reputations from the incident than other supermarket chains. Ipsos Mori asked if people felt more or less favourable towards the six major UK supermarkets after the incident. In response, 20% of those polled said they felt less favourably about Tesco, and 14% felt less favourably about Iceland. But both chains would probably point to the fact that almost 70% of respondents "felt the same" about them. A Tesco spokesperson told the BBC: "The horsemeat issue impacted customer confidence across the retail industry. In response to the issue, we promised our customers we would make significant changes, and we have done so. "We take nothing for granted and will continue to work hard to ensure customers know our food is of the highest quality." Iceland did not respond to a BBC enquiry. Retailers have been working hard to regain trust, according to industry body the British Retail Consortium: "Over the last 12 months suppliers have been reassessed, supply chains are less complex including an increase in sourcing from the UK, there has been an increase in the unannounced audits of suppliers, and increased testing of ingredients." Back in Ealing, Mr Dzido is proud of the fact that he travels to Smithfield meat market and personally selects the meat sold in his shop. "We offer a bit more than supermarkets do. We are in more direct contact with the farmers, there's less people in the chain before we process any of the meat. "I know every ounce of meat hanging in my fridge, what it is and where it's come from."